A presenter stands in front of a well-designed logo projected on the screen. She starts her presentation. Each time she speaks a word with a “P” sound, she stops talking. This is because her “P” resonates with emphasis through the speakers, she’s feeling uncomfortable and noticeably irritated. It happens again. She stops talking and shifts her attention to the sound. It happens again. And again. Okay – you get the auditory picture. One of my training techniques is for participants to imagine a long table in front of them with a bountiful meal set and everyone they love sitting in seats on both sides of the table. I instruct my clients to open their arms and say, “Welcome, I see you.” My clients comment that this image and activity evokes a feeling of “heart” and open graciousness. Service heart sets our intention for our presentation beyond “self.” Instead, it says, “I’m here to be of service, to offer, to inspire, to motivate or to lead.” This powerful intention is momentum for a positive and optimistic “vibe.” Because our emotions are contagious your positive and optimistic energy is a true gift for your audience. But now, you’ve got this irritating microphone sound distracting you. How do you stay open, attentive and gracious while hearing “P” sounds echo in the room? If your audience members are the most important people in the room, let’s be concerned for them. Maybe you can ask early on, “Can you hear me okay?” And then, follow up with, “is the feedback too loud? I want you to be able to focus on the message and not how the microphone sounds”. Most often, you’ll get a clear indicator of what needs to happen. 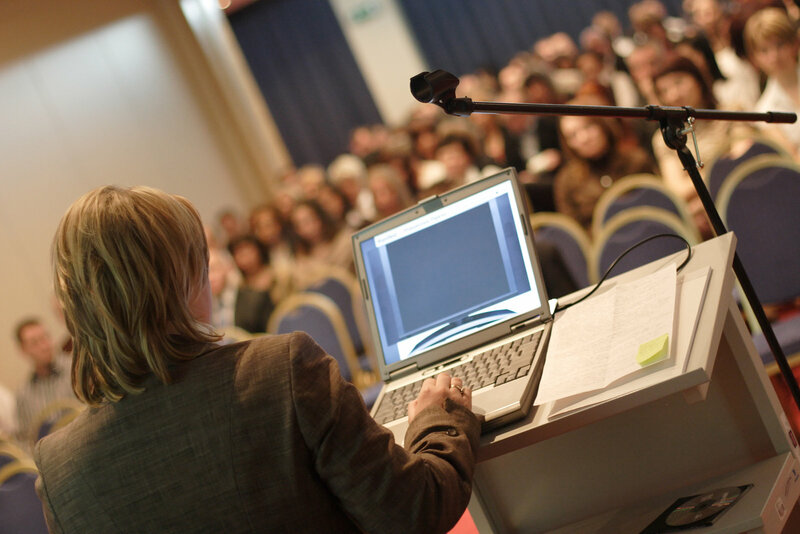 Most audiences bring goodwill to speaking events and they want you to succeed. If they can help you do that by answering a question or two, that will make the connection even better.